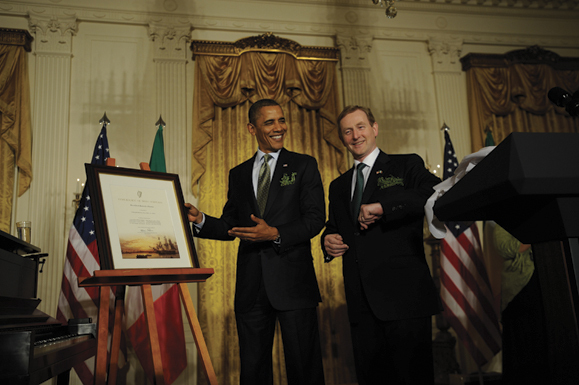 Demand for the government’s Certificate of Irish Heritage – that prop of countless photo ops which gets presented to any international dignity gracious enough to mention (or careless enough to let slip) that they have an ancestor from the old sod – has proved “disappointing”. Since its launch in September last year, only 1,042 certificates have been issued, it was reported this week. The Irish-American news site Irish Central interviewed Irish Americans to find out why, and the respondents reportedly said the procedure involved in acquiring a certificate was too complicated. You see, in order to claim an Irish ancestry certificate, you had to be able to prove you had an Irish ancestor. That must be what’s been getting in the way. It isn’t that no one can be arsed acquiring a certificate of Irish heritage. It’s that millions and millions of people would dearly love one but they just don’t want to be put to any trouble about it. It’s all instant gratification with these people. They lack commitment. It’s not us, it’s them. In truth, you can probably pick up a ‘Kiss Me I’m Irish’ t-shirt for €10, whereas the price of a Certificate of Irish Heritage, which is about as useful, is quite a bit higher. It’s billed as costing €40, but that’s because the government has turned all Ryanair about hidden costs. Once you add in shipping and VAT, it actually comes in at €55.35, unframed. And let that be a lesson to those who persist in saying Michael O’Leary should be running the country. Anyway, because the procedure was regarded as too onerous, it has been relaxed in recent months. The burden of proving your Irish roots has been lifted. So your correspondent has done some investigating (not at all, don’t mention it, that’s what I’m here for) to establish just how complicated it now is. The procedure now is that you have to know your own name and the name of your Irish ancestor. Easy-peasy so far, no? Then you have to answer two of the following seven questions: What town or parish in Ireland did the person come from? What year were they born? What year did they leave Ireland? What was their port of departure? What was their port of arrival? Where did they settle in their adopted country? What was their occupation? Ancestor: Dalton Silvermoor; emigrated to New York in 1830; became an interpretive dance critic and a celebrated wit; had children by seven different men, at least one of them a serving president; made a heroic stab at the Northwest Passage; oh, and got embroiled in one of the South American revolutions. Hey presto, yours truly suddenly has an interesting pedigree. Ancestor: Falmouth Kearney, labourer; left his home in Moneygall in 1850, bound for Americay; had 10 children and settled in Indiana. Bingo, I’m on Barack Obama’s Christmas card list. The whole idea of this sort of genealogical vanity is that you turn out to be more important than you – and more importantly, everyone else – thought you were. And this may be what’s putting people off buying a certificate of Irish heritage. No one would be inclined to boast about being the descendant of some worthless alcoholic farmhand in County Roscommon. Poor ancestors are fine but they have to be Worthy Poor. And ideally we’d prefer to be descended from Daniel O’Connell or Granuaile. Why spend €55.35 to show everyone that you’re not?